Nail art. It can be a total bummer sometimes. We often see complicated tutorials of intricate designs and are often put off by it. Something a little simpler would definitely draw more people in. Maintaining your nails is honestly the best accessory since you just need to do them only about, once a week. These tutorials are quite simple and can be done with the things you’d find right at home. So, read on to get pretty nails! and is the perfect choice for someone who is just starting out. You don’t need any extra tools apart from your nail polishes for this one. This tutorial will be described using certain colors, but it’s entirely up to you! Play around with your choice of colors! On clean nails, apply a base coat to protect your nails. 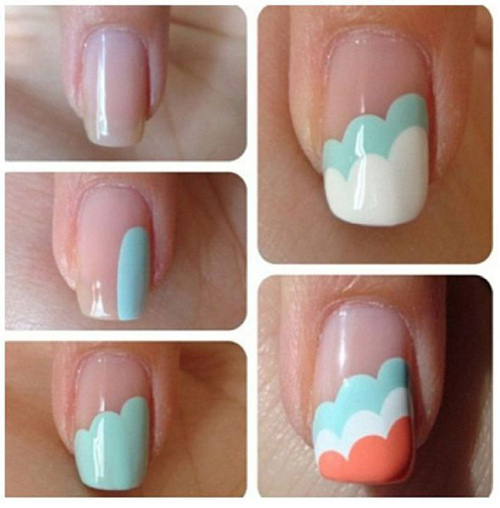 Use the pastel blue color to create a vertical stripe on one corner, while leaving some space empty near the cuticle. Now paint from the center, a little lower. Create the last stripe, again lower. You should have what looks 3 steps. Repeat the steps but starting from below the blue. Do the same with the pastel coral. Now that you’ve gotten the hang of doing nail art with just the nail polish, it’s time to start adding tools to the pretty picture! 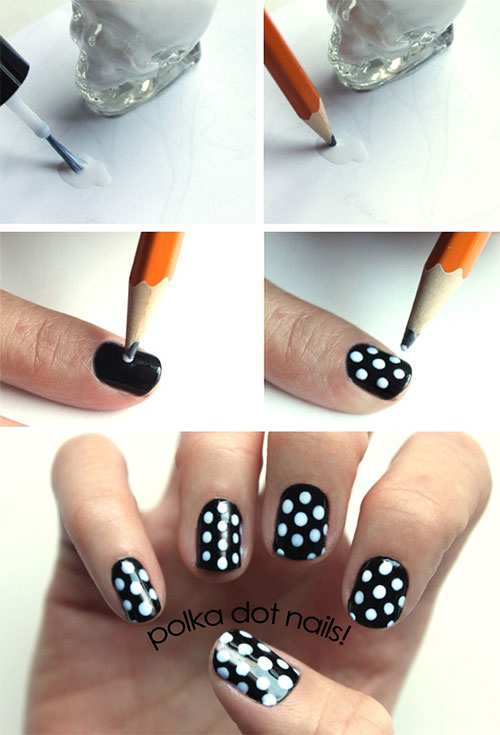 This is also an incredibly simple nail art that you can easily do! It’s very casual so it can be worn at all times. Start by painting all of your nails with the sky blue shade as your base color. Paint over it with white in a heart shape as shown in the image. 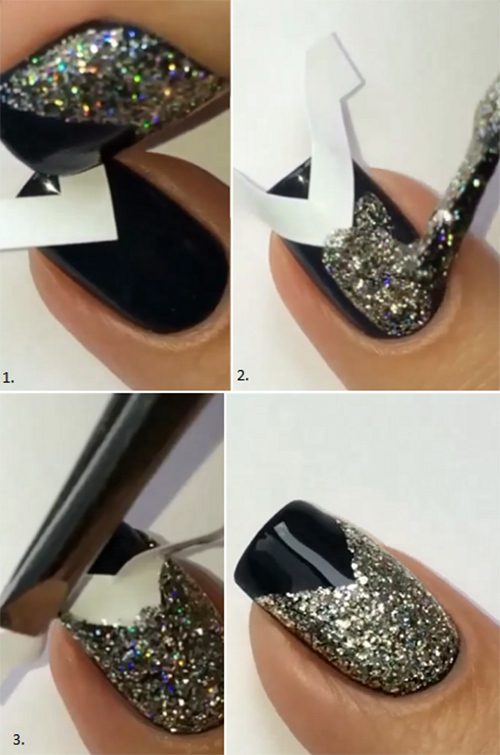 Using a nail striper or a paintbrush dipped in black nail polish, follow the shape where the white and blue meet and create two loops at the center so that it looks like a bow. Seal it with a top coat, and you are good to go! Okay, I know what you’re thinking. This may seem complicated, but the best part is, it’s actually easy. For the tutorial, red, white and blue were used but the choice of colors is all up to you! 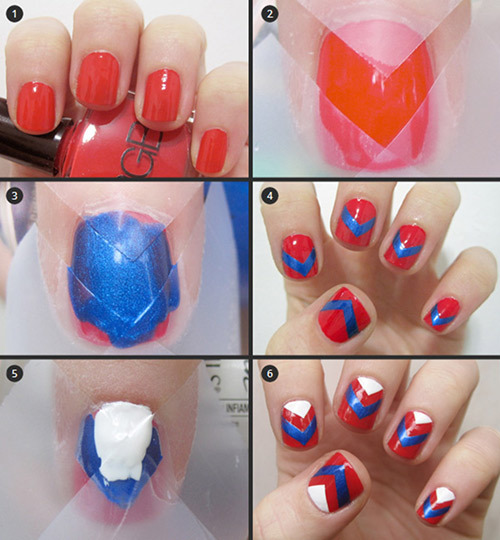 Use red nail polish as the base for the chevron nail art. Strategically place the tape so that it creates a chevron stencil. Paint over it with the blue polish. Wait for a minute or so to remove the tape. Now place the tape as shown near the cuticle and paint the area with white. Again, wait for a minute before pulling off the tape, and seal it all with a top coat. Is there a party around the corner? 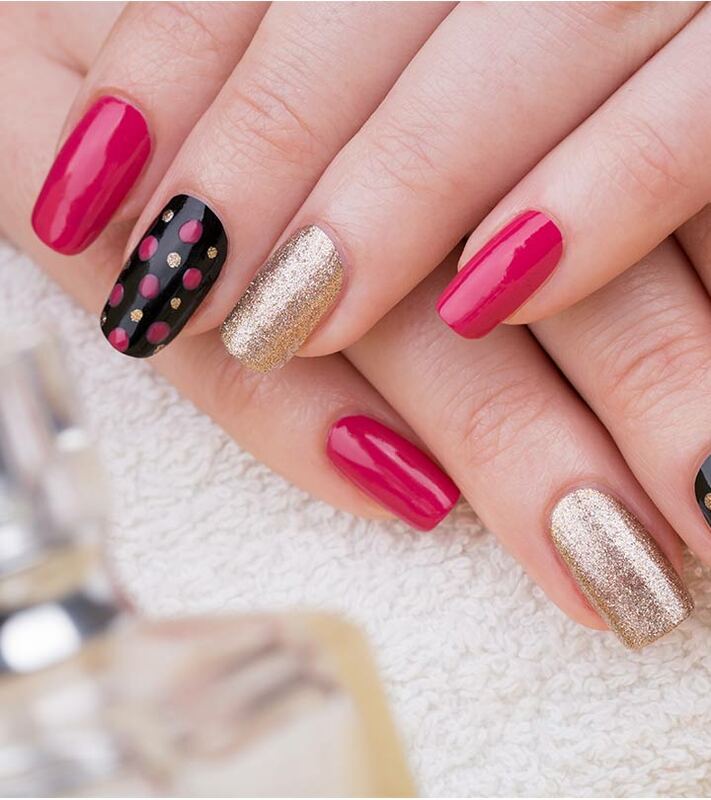 You probably had plans of going to the salon to get your nails done, but something else popped up, and now, you’re short on time with your nails undone. 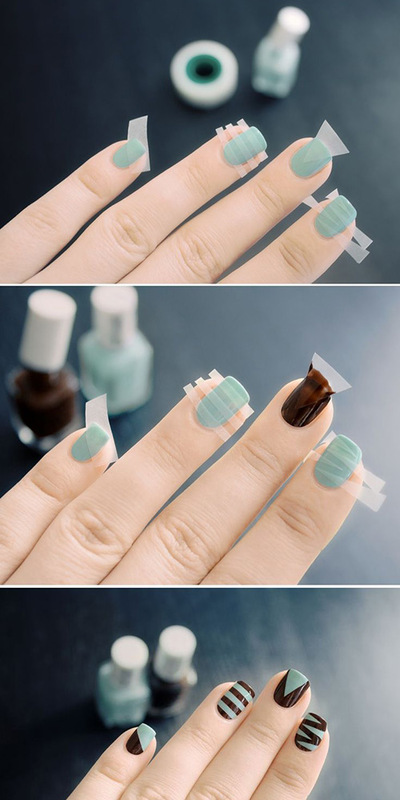 This nail art is perfect as they’re easy enough to do when you’re in a rush. A ‘V’ shaped sticker or a piece of tape. Paint all your nails black as the background color. Place the V sticker or the corner of a piece of tape near the tips as shown. Paint the bottom half with the glitter polish. Wait for a minute before you carefully pull away from the tape or sticker. A fan of sailing and the vast open waters? Then this nautical nail is probably perfect for you. And if for some reason you don’t like the ocean, that’s okay because this still makes for a really cute nail design. Nail striper or a fine paint brush. Use a nail striper dipped in navy blue nail polish to create stripes. Now, using the blunt side of a toothpick, create an anchor design. First, create a tiny circle. Then, create a line down from the circle. Draw two lines from the vertical line so it looks like an anchor. Finally, draw a horizontal line in the middle to complete it. Seal it with a top coat and you are ready to sail away! 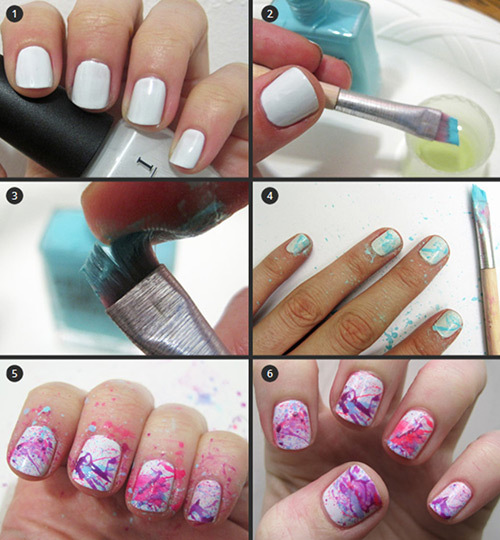 Let’s check out some tips that would make your nail art process a little easier.